When I was a kid, I read a Stephen King story (I know...I was a kid, I said) about an abandoned factory that was overrun by rats. In the course of the story, the exterminator ventures into the bowels of the factory and discovers its horrific secret--a mutant, malevolent hairless white super-rat queen the size of a horse, with legions of rat-drones bringing it nourishment as it pumps out more flesh-eating mutant rats in a foul ichor-covered chamber... you get the idea. 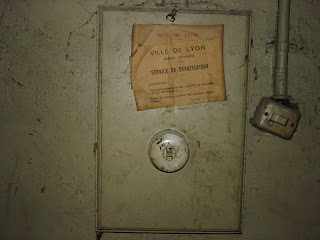 I was pretty certain there was something like that living in the basement of our 150-year-old building. 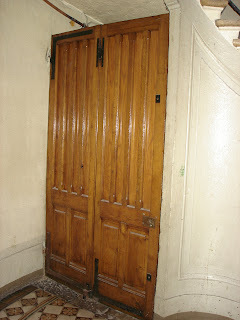 Why else the perpetually-locked 10-foot solid-oak door? Why else the threatening signs? What else, other than a fearsomely efficient apex predator, could explain the complete lack of typical urban pests of either Class Insecta or Order Rodentia? 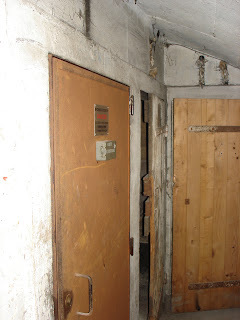 Then one day I noticed that the perpetually-locked basement door might not be so locked. In fact, it sags rather heavily to one side on its hinges. If I could get enough leverage on it to lift it dead upright, the bolt just might have enough clearance to slip out of the jamb. So I tried it. Putting my shoulder into it and pulling towards me at the same time, the door shifted suddenly up...and swung open. Stone stairs led down into the inky darkness. Fearful of being discovered, I quickly re-sealed the door and started making plans to return. I'd need flashlights, a camera, a respirator mask--and a big rubber mallet or clawhammer for rat-whomping. I'd need a time, too, when no one was likely to be around during daylight hours. Sunday afternoon was that day. With the wife and kids napping, I slipped away to the basement and dislocated the door. Flicking on my headlamp, I stepped onto the stairs and pulled the door to behind me. Another threatening sign on the wall. 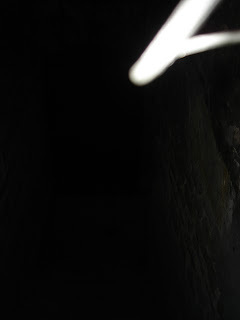 I walked quietly down the steps to where I could see around the curve of the wall, and at the bottom of the steps, my headlamp beam picked out...another door. Steel this time, and clearly barred. Dang. Probably leads to the storeroom of the shoe store on the front corner of the building, and bolted up tight. 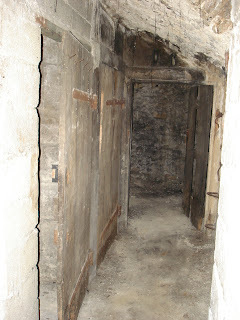 But as I stepped closer for a better look at the door, I realized that the curve of the stairwell hid another passage, to the right of the door: A stone archway, head-high, opening into a chamber with a dirt floor and a passage leading away on the other side. I listened, anticipating perhaps the scurry of feet or heavy fetid breathing or the low growl of something inhuman--but nothing. Suddenly feeling that my headlamp beam was very inadequate, I quickly scanned the small room: stone walls, dirt floor, passages leading away on not one but two sides, and completely empty. Near the rough ceiling, a forest of pipes, and a single, naked light bulb. Bingo! I traced the electrical conduit back from the bulb socket and found a very dusty switch. Click. As the light came on, I suddenly felt a little silly about my childish, irrational fears: it was, after all, just a cave (pronounced cahve); most French apartment buildings of this era have them as additional individual storage spaces, since they lack closets or storage rooms or much else in terms of where to store one's fishing rods or camping gear or wine collections. 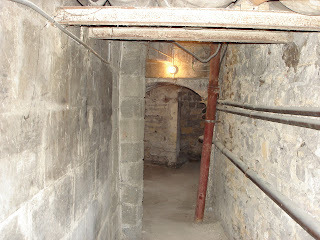 An apartment in our neighborhood that we seriously considered renting (but eventually rejected due to its lack of a balcony) had a quite substantial cave, maybe 15 feet deep by 10 with barrel-vaulted ceiling, and the current tenants had it stacked all the way 'round with wine. These caves, though, behind individual wooden doors arrayed off the main passage like a capital letter "E", were completely empty, save for the odd piece of scrap wood or flattened cardboard. Why they aren't in use, I can't say. I'd sure pay a few extra Euros a month to have space to keep some of my extra crap that's currently jammed in corners all over my apartment. In New York they could get top dollar for that kind of space; in Chapel Hill, there would be 4 college kids living in it. But here, for whatever reason, they prefer to just keep the space empty and locked up. Glad you liked it, though I'll admit it was atypical of what I usually post--most of the monsters I encounter in France are metaphorical. Stay tuned for Lovecraftian odes to the US Overseas Tax Code.